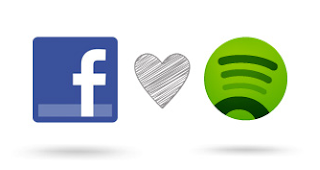 The idea behind Facebook Music is that whenever you or your friends listen to music from one of Facebook's music partners, the music gets published to your Timeline for friends to see. The details also show up as an update to the news feed and ticker. When your friends see that you've recently listened to "Give Me Everything (Tonight)" by Pitbull, they can click on the link to listen to it. If they see your activity in their ticker, they can click on the activity to begin listening to the song with you in real time, with the option to start a chat. 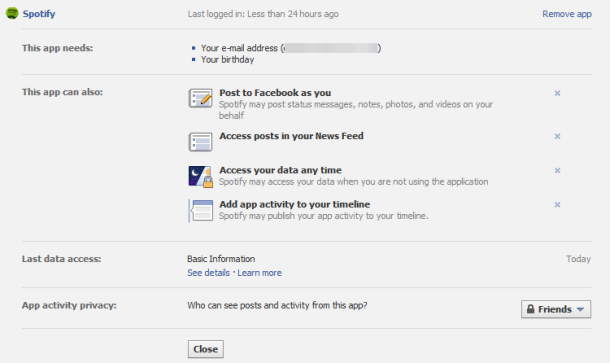 To start sharing music on Facebook, a link between the music service and Facebook needs to be established. 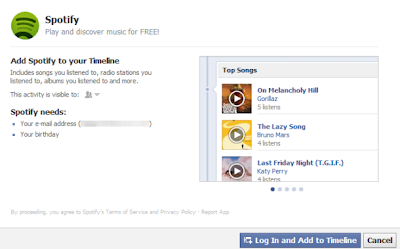 Spotify, Mog, Rdio, iHeartRadio, Slacker, Earbits, Turntable, SoundCloud, and Rhapsody all work with Facebook Music. The listening activity of your friends shows up in your news feed, ticker, and their Timeline. You can also click on the Music app in the left sidebar, to view all of your friends' listening activities, including top songs and trending albums. If you prefer to bookmark that section, here's the direct link. To listen to a song that a friend recently listened to, simply click on the play link. If you already have the music service up, the music will begin playing through their Web app or desktop app. If you don't already have the music service up, a pop-up window will appear, asking if you'd like to launch it. If you're not using the same music service as your friends, you have the option of creating a new link (and a new account) or listening to the song with your preferred music service. That's it. Enjoy listening, sharing, and discovering music with your friends--or snickering about their terrible tastes. Either way, it's win-win! This helps a lot..otherwise every now and then I had to open grooveshark for the same. this really is a good feature.